An ensemble of eight musicians with Dore Kalmar as the band leader will perform the Latin fusion pieces with inspirations like, but not limited to, Wayne Shorter, Pat Matheny, Michel Camilo, and Dave Weckl. Rob Gaylard will perform a set of his own songs and Julia Garber will present covers of Carrie Underwood, Ariana Grande, and Selena Gomez songs, and assorted others, ranging from Cole Porter's "So in Love" to Lin-Manuel Miranda's "Burn" from Hamilton. Every month Tammy Faymous will pay tribute to influential "divas"! Join us on a Harry Potter-themed scavenger hunt for ages 10 and up! Young wizards will enjoy a trip to the Metropolitan Museum, in search of art that echoes characters and enchanted objects in the Harry Potter books. You'll track down serpents, Dumbledore look-alikes, and figures as scary as any Death Eater. This hunt references the books to provide a bridge to many wonderful works of art. Kids must be accompanied by an adult, but all-adult teams can compete separately. Price includes museum admission. Advance purchase is required. 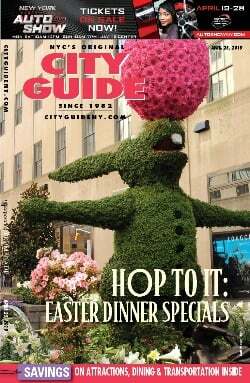 Celebrate Mother's Day with a fun visit to our Mother's Day Bazaar, the largest in NYC. Enjoy time together strolling the aisle filled with talented local artisans, designers and independent dealers, and pick-up a sweet gift for mom (and maybe also yourself). If shopping makes you hungry enjoy some delicious bites in our artisanal food court. On Mother’s Day, Geoffrey Zakarian’s The Lambs Club is offering a Grand Buffet prix-fixe brunch featuring live jazz music performed by Melanie & The Bianco Martinis. For $85 for adults and $65 for children, guests will be able to dine on house made breads and pastries, raw bar selections, salads, a carving station, a waffle station and a selection of delicious pastas. To end this wonderful Mother’s Day brunch on a sweet note, desserts including Red Velvet Cake, Assorted Flower Cupcakes, Mini Banana Pudding and a variety of other desserts will be offered. All Moms will be treated to a make-your-own flower bouquet bar to compliment their perfect day. Celebrating its 49th Anniversary this 2018, Bobby Van’s Steakhouse has earned its place among the venerable New York dining institutions, thanks in part to a continued commitment to cooking techniques perfected years ago by the founding fathers of contemporary New York steakhouse cuisine. The new restaurant invites diners to the same exquisitely prepared dining experience as its sister restaurants, in addition to a special Saturday and Sunday brunch. Bobby Van’s is open for Breakfast, Lunch and Dinner on Mother’s Day, and will be serving delectable dishes from their a la carte menu. 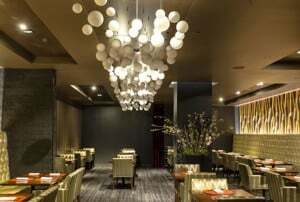 Signature menu items include the Porterhouse Steak (this premium cut steak can be shared between two, three or four), Homemade Old School Lasagna and the Chilean Sea Bass, served with Miso & Tamari Glazed, Asparagus, Bok Choy & Shitake Mushroom in White Truffle Fish Broth. Mother's Day is a time to appreciate mothers and mother figures. Explore the digital interactive in Port City, 1609-1898 to learn about Abigail Franks and Mary Alexander, whose independence, intelligence, and identity enriched the lives of their families. Create a card to express your gratitude and love for all that your mother does for you! Family programs are free with Museum admission and for members, geared to families with children ages 6-12 years old, and include a snack. Activities are designed for adults and children to complete together. Dine at charming SoHo Italian Provencal Restaurant MAMO this Mother’s Day Sunday. The New York outpost of Mamo Le Michelangelo located in Antibes, France, MAMO NYC will de-light diners looking to dine in sophistication with its regular menu in addition to a special Mother’s Day menu, featuring: Burrata con pomodori, granchio e salsa al basilico (burrata with tomatoes, crab and basil sauce), Gnocchi di patate al tartufo e asparagi (homemade gnocchi with truffle and asparagus), Salmone arrosto con verdure di stagione e pure di piselli (roasted salmon with seasonal vegetables and peas puree) and for desert Tartelletta ai frutti rossi con pistacchi (berry tart with pistachios). 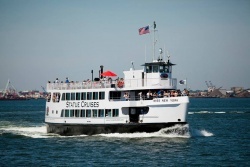 Treat mom to our Mother's Day Lunch Cruise! On this beautiful Sunday, relax and sightsee our amazing city as we sail to the Statue of Liberty. With a complimentary drink on the house, live DJ entertainment, and plenty of photo ops, this mother's day gift. Aboard our Mother's Day Cruise, enjoy of live music as we showcase the amazing New York City's skyline. At our Mimosas & Sangrias, enjoy of refreshing beverages and cocktails. Food available for purchase. From Skyport Marina, we start boarding at 2:00 PM and depart at 2:30 PM. After tons of fun, we return to the dock at 4:30 PM. The ADELPHI ORCHESTRA Presents: “Bohemian Rhapsody Gala” in New York City Dvorak, Mahler, Tchaikovsky, Saint-Saëns Sunday, May 13 2018 Good Shepherd Faith Presbyterian Church, New York, NY The Adelphi Orchestra, now in its 64th season of Music for All, presents “Bohemian Rhapsody” under the baton of Principal Conductor Richard Owen on Sunday, May 13th at 7:00 PM, Good Shepherd Faith Presbyterian Church, NYC. Bohemian Rhapsody features a diverse program presenting the critically acclaimed baritone Andrew Cummings in Mahler’s Rückert-Lieder. Saint-Saëns’s Introduction & Rondo capriccioso in A minor will be performed by 2016 Adelphi Orchestra Young Artist Competition winner, Nathan Meltzer, who in 2017 at age 17 became the youngest violinist to attain first place in the Windsor Festival String Competition. The program opens with Dvo?ák’s Carnival Overture and dramatically concludes with the beautiful Tchaikovsky: Symphony no 5 in E minor, Op. 64. All Proceeds go to the Young Artist Program. FACTION Art Projects announce their second show Harlem Perspectives, an exhibition celebrating the local talent of Harlem and uptown New York. Following a hugely successful inaugural show at the newly opened Gallery 8 on Frederick Douglass Boulevard, the FACTION team return to Harlem with an eclectic mix of local artists, who live and work above Manhattan’s 110th Street. Beginning Thursday, April 5, 2018, at 12 noon EST, tickets for The Shed’s pre-opening program A Prelude to The Shed will be available to the public. The free, two-week arts event (May 1–13) will showcase The Shed’s mission to support artistic invention and present multiple art forms in one flexible space. Architect Kunlé Adeyemi of NLÉ Works has collaborated with artist Tino Sehgal to transform an undeveloped lot at Tenth Avenue and West 31st Street (one block from The Shed’s permanent home) into a temporary venue whose structural elements can be moved and reconfigured in a fluid integration of architecture and choreography. While Don Giovanni dances at the edge of a precipice, three extraordinary women pursue him, each seeking their own reckoning, pleasure, and liberation. Is the great seducer destroying or empowering the women he encounters? What story does the sublime music tell? This visceral new production wrestles with Mozart's elusive masterpiece in our present cultural moment. One of the greatest American playwrights of the twentieth century, Tennessee Williams (1911–1983) was a master of language and a tireless craftsman. This exhibition focuses on Williams's career during the years 1939–1957, when he authored such masterpieces as The Glass Menagerie, A Streetcar Named Desire, and Cat on a Hot Tin Roof. The show examines his creative process and his involvement with the production of his plays, along with their reception and lasting impact. Uniting his original drafts, private diaries, and personal letters with paintings, photographs, production stills, and other objects, the exhibition tells the story of one man's struggle for self-expression and how it changed the landscape of American drama. Celebrated comedian, singer and cabaret star, Amber Martin, curates and hosts a weekly showcase of some of the most brilliant performers in NYC, thus the world. A TimeOutNY Pick! The Amber Zone happens each Monday, with doors at 7pm and show at 8pm, Amber Martin will present a different one-hour program starring a bevy of downtown and beyond artists (Amber's very talented friends!). Each week, a different show by a different performer. You never know who or what you'll get, but you can rest assured it will be fun, truly brilliant and most importantly, intimate. No reservations. Please note… First come first served, and the room is intimate, so it will fill up quickly. Amber Martin is a NYC – based performing artist, vocalist and funny lady with a pretty great resume in downtown performance chic. Each Monday, Amber plays producer of the show as well as her own version of Joe the Bartender! She'll be serving them up cold and classy in the front bar while you sip away and enjoy a true NYC – style show experience in the back! Featuring Juilliard Dance's Class of 2018 in a diverse program of solos and duets choreographed by these graduating dancers, as well as alumni and faculty, plus selections from the major repertory. Swirling disks of dust and gas surround young stars, and these disks contain the building blocks for new planets. It would take 100 million years to see a planet fully form, but luckily there are plenty of planetary systems in development for us to observe. By studying and compiling “snapshots” from nearby stars, Alycia Weinberger takes us on a journey back in time to the origins of planets. Support for Hayden Planetarium Programs is provided by the Schaffner Family and the Horace W. Goldsmith Endowment Fund. Deadpool is taking over a 7-Eleven store on Monday in total anti-hero fashion. On Monday, May 14th, an NYC 7-Eleven will be transformed into a Deadpool fan's dream. With exclusive and free Deadpool snacks and drinks, ranging from free Mutant Monster Slurpee drinks for all to Chimichangas and pizza (for true fans who come dressed in "Deadpool Eyes"). If snacking isn't your thing, photo booths and face painting will be available, offering experiences for everyone. Want to meet the creator of the Deadpool comic book? Rob Liefeld will also stop by the store to get his Slurpee on. Fans will also get to try the new Deadpool Augmented Reality experience in store via the 7-Eleven app. Passions flare in this hour-long adaptation of one of the world's most beloved operas. One of four extraordinary hour-long performances produced by New York City Opera, including highlights and previews of Ctiy Opera's upcoming productions. On May 15, Hudson River Community Sailing (HRCS), a leading non-profit organization that develops leadership and academic success for underserved NYC youth through sailing education, will host its 11th annual Dark ‘n’ Stormy fundraiser. One of HRCS’s largest fundraisers, Dark ‘n’ Stormy will take place from 7-10pm at the Frying Pan on West 26th Street. The benefit will feature a live band, food, and open bar, and a raffle with extensive prizes. Tickets can be purchased online. All proceeds from the event support the HRCS mission to help underprivileged students succeed at school, at work, and in life. HRCS has improved the lives of thousands of students since its founding in 2007. 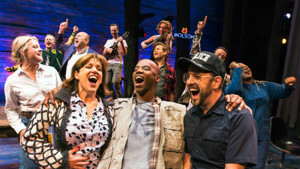 Whether you're a New Yorker looking for a unique date night or a country western dancing queen, Opry City Stage encourages everyone to put on their dancing shoes and cowboy boots for Two-Step Tuesdays, where they will be featuring Two-Step lessons and dancing with live performances. Comic Book Club is a live talk show and podcast held every Tuesday at 8:00 pm in NYC! It's hosted by Pete LePage, Justin Tyler, and Alex Zalben. We talk nerdy stuff. Delicate, artisanal confections, wagashi are traditionally served as an accompaniment to the tea ceremony. The shapes, colors and ingredients of these sweets are inspired by the natural world, often crafted to coordinate with the seasons. At this talk, wagashi confectioner Miyuki Hyodo, of miuxnyc, shares the cultural traditions surrounding these uniquely Japanese sweets, and introduces her contemporary approach that incorporates seasonal local ingredients. Hyodo will also give an on-stage demonstration of the elegant art of wagashi making. Followed by a tasting reception featuring early-summer wagashi. Members of the YCC Acquisitions Committee are invited to attend a curatorial presentation and to vote on works to be acquired for the Guggenheim's contemporary collection. The YCC Acquisitions Committee plays an integral part in growing the museum's contemporary-art collection by meeting twice a year to vote on the acquisition of works proposed by our curators. Exclusively for YCC Acquisitions Committee Members. Seth Sikes will return to Feinstein’s/54 Below in The Songs That Got Away, an all-new show singing Judy Garland songs he hasn’t yet performed in his previous tributes to the legend, plus some that Garland never got the chance to sing herself. Sikes has been performing at Feinstein’s/54 Below in a series of consistently sold-out appearances in his critically-acclaimed tributes to Garland (which won a Broadway World Award), Liza Minnelli and Bernadette Peters. The New York Times said of Sikes’s debut, “The performance — less an impression of Ms. Garland than an interpretation of her vibrato-heavy method of belting – was a hit.” The critics were just as kind for his follow-up show Seth Sikes Sings Liza Minnelli and The New York Post said, “It was a heartfelt concert. Sikes has a heap of fans and his audiences are always tightly packed and brimming with enthusiasm for his booming, jazzy renditions of their favorite songs.” Previously best known in the theater as an Assistant Director (on shows like The Band’s Visit, The Nance, and Pageant), Sikes will perform with a full band under the direction of Jesse Kissel. The evening will be directed by Eric Gilliland. At the Musical Jam you'll get an opportunity to improvise musical scenes on The Striker Stage! Open to everyone; improvisors, students, house team performers and community members. Hosted by a cast member of #sfw team, VERN, the Musical Jam boasts the musical talents of Dan Reitz on the keys and an hour of fun and laughter. No singing experience needed, come ready to sing your heart out! Express is excited to invite you to an intimate evening with Bodhi, aka Menswear Dog, and his human Yena Kim focused on tips for building a unique personal brand. Stop by 51st and Madison for cocktails and light bites, and a meet-and-greet with Menswear Dog following the conversation. Must be 21 years of age. This event is free and open to the public. This voyage through the history of American domestic interiors uses architectural elements, furnishings, silver, glass, and other decorative and utilitarian objects to tell fascinating stories of American life, from the seventeenth through the early twentieth century. Many of the newly renovated period rooms are equipped with state-of-the-art interactive computer touch screens, which explore the social and historical context of the rooms and catalogue information about their furnishings. The Henry R. Luce Center for the Study of American Art displays additional examples of American art. Benjamin Easton is a pianist and arranger based in New York City. Easton is co-bandleader of The Academy Blues Project, a multi-genre group begun in 2012. ABP's newest record, Upwelling, was released in April of this year. When not tickling ivories — or hosting piano karaoke at YOUR next private soiree — you may find Ben crosswording, cycling through the boroughs, or listening to Odessey & Oracle on repeat. Gifted with mind-boggling technical skill, penetrating interpretive insight, and enough charisma to light a city, Yuja Wang is a megastar pianist. As the Los Angeles Times wrote, "She eats the world's greatest keyboard challenges for breakfast with one hand tied behind her back." This tour provides an overview of the comprehensive collections of The American Wing and may include paintings, sculpture, furniture, period rooms, and decorative arts, as well as architectural spaces. Periods covered are from Colonial America to the early twentieth-century Frank Lloyd Wright Room, and will emphasize the newly reopened Galleries for Paintings, Sculpture, and Decorative Arts. The American Wing has outstanding examples of furniture by John Townsend, Duncan Phyfe, and Charles-Honoré Lannuier; paintings by John Singleton Copley, Thomas Cole, Winslow Homer, and John Singer Sargent; and sculptures by Augustus Saint-Gaudens. "Her viscerally physical movement wrings every inch of life from her dancers—and you'll be holding your breath, too." —New York Magazine Get a behind-the-scenes look at Artist in Residence Andrea Miller's creative process during open rehearsals for a new work during Museum hours. Then, see it all come together in the world premiere performances of this thoughtful, invigorating integration of art, architecture, and movement. Join more than 2,200 security and law enforcement professionals for the ASIS Security Conference and Expo. Collaborate with peers, examine the latest trends, and discover the innovative products and services needed to ensure the safety and security of your people and property. Admission to the Expo is FREE. Attend two intensive days of education, networking, and the Expo. This is your best two-day security investment of the year! Pursuing ASIS Board Certification? Take the CPP, PCI, or PSP classroom review prior to the conference as part of your study preparation. New York Cares, the largest volunteer network in the city, will host their Soirée, an immersive evening of masquerade, mystery, and magic benefitting the education programs offered by New York Cares. Join at the Bowery Hotel on Friday, May 18 for an enchanted evening full of cocktails, tastings, dancing, a silent auction, and so much more. The evening is made possible by the Rising Leaders Committee at New York Cares. Andrew Wiener, Vice President and Director of Leasing at L&L Holding Company, LLC, will be honored at the event. Haven Kids Rock is a music program that was created for at-risk kids in the New York City child welfare and foster care systems. Rock guitarist Jimi K Bones and musician and casting director Nefertiti Jones founded Haven Kids Rock in 2008 to provide children with a creative/enriching/therapeutic outlet. The weekly music program resides within Mott Haven Academy Charter School in the South Bronx and shares a close partnership with The New York Foundling, one of the city's largest and most respected social service agencies. Participation in Haven Kids Rock Music Program presents a unique opportunity for Haven Academy scholars. The students who participate do not typically have regular access to enrichment opportunities outside of the school environment. As an extension of the school day, Haven Kids Rock provides a therapeutic environment by giving scholars a chance for self-expression through music, acting and dance. Orchestra of St. Luke's pairs with Taylor 2 of Paul Taylor American Modern Dance for a free concert for kids, mixing exciting music and modern dance. Explore Frank Lloyd Wright's architectural shapes and spaces through drawing activities in the museum's galleries. Art materials, including a drawing board, paper, pencils, and erasers, are available for loan at the Family Activity Kiosk. This program is geared towards teens, though families with children of all ages are welcome. No registration is required. Family Programs are supported in part by JW Marriott. The 12th annual Dance Parade will take place Saturday May 19th, starting at 1 PM at 21st St. & Broadway, NYC. Approx. 800 dancers, performing 80 different styles of dance, with their colorful costumes and music, will delight spectators as they boogie down Broadway through Union Sq. and University Place, across 8th Street/St. Mark's Place, to Tompkins Square Park, arriving at approx. 3 PM. 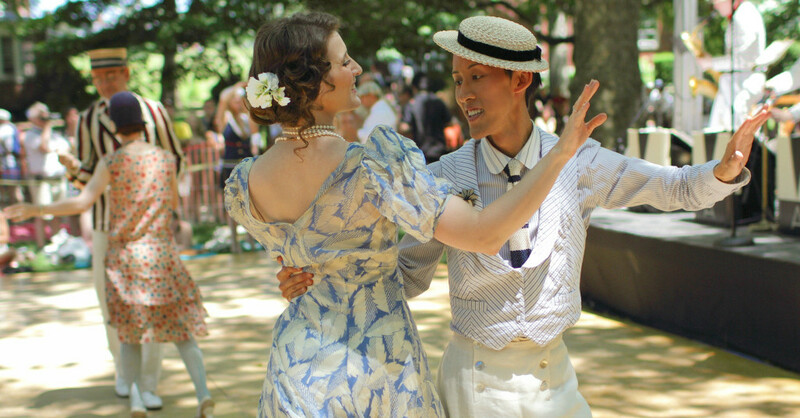 In the Park, 5 stages will be set up to continue the festivities with performances by many of the parading companies, social dancing, and free dance lessons. Grand Marshals this year are Camille A. Brown, Michela "Bare Fee" Mallozzi, WBLS DJ Doc Martin, and Brooklyn City Council Member Rafael Espinal. Symphony Space celebrates the legacy of one of the greatest musical figures with an eight-hour marathon event of music, dance, film, and conversation that explores the many facet's of Leonard Bernstein's creative life. A poet at heart and a virtuoso of the highest order, Evgeny Kissin is one of the most magnificent pianists of any generation. A master in the grand Russian tradition, The New York Times has lauded his "blend of technical mastery and eloquent artistry" while The Telegraph has praised the "lovely limpid clarity" of his playing. Once a prodigy, now a living legend, Kissin's recitals cannot be missed. On the surface, Robert F. Kennedy and Martin Luther King Jr. were born worlds apart?culturally, geographically, racially, financially, and politically. But by the time they were killed within two months of each other in 1968, their worlds had come together. Images taken by some of the most renowned photojournalists of the era?alongside original correspondence, publications, and ephemera?illustrate the overlapping trajectory of their lives, exploring their deepening tie as well as how their interests expanded beyond civil rights and organized crime to encompass shared concerns for the poor and opposition to the war in Vietnam. The lives of Robert F. Kennedy and Martin Luther King Jr., who were born into very different worlds, managed to intersect in many ways prior to their deaths in 1968. On the occasion of the 50th anniversary of their assassinations, this exhibit incorporates images from some of the best-known photojournalists of the era along with correspondence, publications and other materials that showcase both men's lives and work. A tour of favorite objects; guide's choice, your treat. Exhibit: The Lost Warhols, a one-of-a-kind art exhibition based on images of Andy Warhol, is a collection of 66 unique works. The exhibit features Karen Bystedt's original photographs of Andy Warhol taken in 1983, as well as a series of collaborative mixed media works by critically acclaimed and emerging street artists such as Peter Tunney, Speedy Graphito, Gregory Siff, Bradley Theodore, and The Producer BDB. This marks the first time all 66 works will be exhibited as an ensemble. The eclectic pieces are all for sale to benefit God's Love We Deliver, the metropolitan area's leading provider of medically-tailored, nutritious meals for people who are too sick to shop or cook for themselves. The organization prepares and delivers 7,000 meals daily to those in need in New York City. For more information: thelostwarhols.com. The exhibit is open from 11AM-6PM every day except Sunday. Eric LoPresti makes artwork that examines the imposition of technology upon the environment and the aftermath of the Cold War. His dramatic landscapes juxtapose abstract elements with representations of the vast deserts of the American West, exploring relationships between science, identity, history, and conflict. Following in the painterly tradition of the apocalyptic sublime, LoPresti's artistic practice explores how trauma and beauty shape our lives. Long-Sharp Gallery is delighted to present a micro exhibit of prints and multiples by Joan Miró that span a decade of his amazing career. Works from 1971-1981 are included in the exhibit, opening April 18 at the gallery's New York Project Space. Windows have been placed on the back of each of the framed prints to show its certification by either Miró's grandson, Emilio Fernandez Miró, or Rosa Maria Malet, the former director of the Joan Miró Foundation (Fundació Joan Miró). The exhibit ends May 25th. Please contact the gallery for an e-catalogue of the works. Vestiges & Verse: Notes from the Newfangled Epic unites more than two hundred and fifty works by twenty-one seminal and recently discovered self-taught artists, who will be introduced for the first time through the examination of the idiosyncratic structures of their lifelong, intricate narratives—notably, their sequential and developing aspects. Rare manuscripts, series of drawings, illustrated notebooks with coded texts, expanding cartography, journals, and multi-part collages will provide an art historical and pluridisciplinary perspective on the mechanisms behind visual storytelling. ioNature: Wheat Field is an interactive kinetic installation that is activated by the presence of an audience. As one approaches, the stalks of wheat ripple in waves as if caused by the invisible currents created by the body moving through space. As you move, so does the wheat; you are interconnected. The entire art installation visually and metaphorically illustrates the connection between the body and nature and the technology used to control it. The installation raises a few questions: What will the future be like when everything is connected? For better or for worse, what role will be we play in using technology to wield those connections? Will technology, which is created and executed by mankind, ever completely control our natural surroundings? For the 50th anniversary of Martin Luther King Jr.'s assassination, this MCNY exhibition explores the activist's New York City ties and the importance of the City in the national civil rights movement. Among the items on view are images of King's church sermons and United Nations speeches as well as documents related to his discussions about race relations with New York City's mayor.